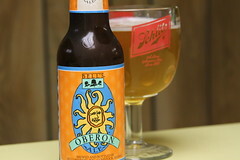 The calendar may have told us that the end of winter was March 20th, but the official end to winter in my eyes is the return of Oberon to area taps. The delightful wheat beer that represents warm days listening to baseball on the radio is set to arrive on taps at Big Hunt on Monday afternoon at 4pm, starting my annual return to alcoholism. If you need me, I’m going to be camping out over at the Hunt until those first beers are pulled. Send my mail over that way, will you?